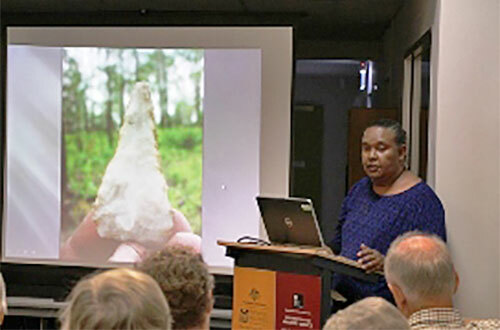 Ms Lorraine Williams presented the annual NAIDOC Week Lecture for 2015 at the Northern Territory Archives Centre on Wednesday 8 July 2015. The theme for NAIDOC Week 2015 was 'we all stand on sacred ground: learn, respect and celebrate', highlighting Aboriginal and Torres Strait Islander peoples' strong spiritual and cultural connection to land and sea. The theme provided an opportunity to promote awareness and pay respect to country, and to honour those who work tirelessly to preserve land, sea and culture and to share the stories of many sites of significance or sacred places with the nation. Go to the NAIDOC website for more information. This year's lecture tied well into that theme. Ms Williams is a Larrakia woman, who has worked extensively on Larrakia Country, as a Heritage Monitor and with many archaeologists, around the Darwin Harbour region. She has co-authored many publications about ethnobotany in the Darwin area and surrounding country. She has worked with the Larrakia Rangers Program. 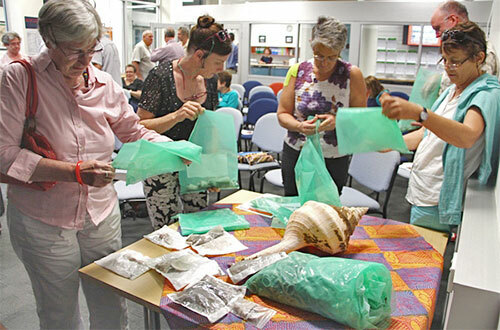 In her presentation, Lorraine shared the stories of her work in archaeology, enthralling the audience with discoveries that reveal the long history of Larrakia occupation in the Darwin area, from the shell middens, spear points, edge ground axes and other important objects and sites.